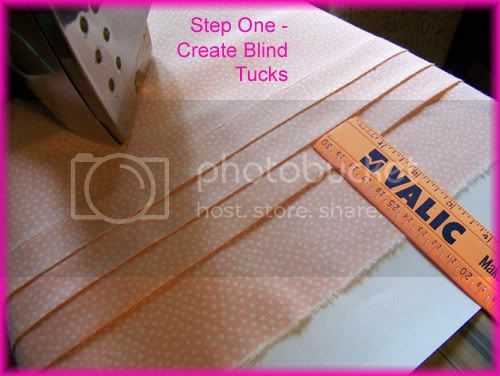 Vintage Threads: Alphabet Adventures - "S is for Sharks Teeth"
Alphabet Adventures - "S is for Sharks Teeth"
Step 1 - Create a series of blind tucks 3/4 inches wide. Each row should just meet the next row. How many tucks to do depends upon your design. For this skirt, I decided to do three rows. 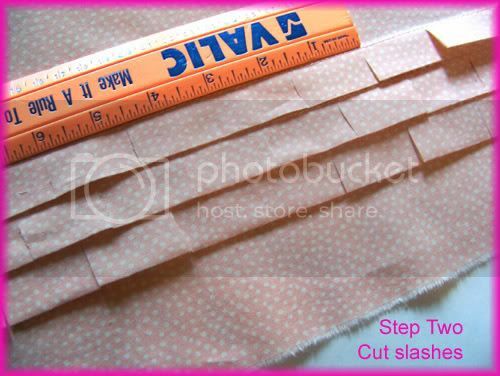 Step 2 - Slash the tucks at intervals 1.5 inches apart, cutting up to, but not past the seamline. Alternate the slashes so that the cuts on one row meet the middle of the "tooth" on the next. It should resemble the way bricks are laid. Step 3 - Turn the cut edges to the back of the "tooth" so that the raw edges meet in the middle, folding at a 45 degree angle. Press neatly. Repeat for all teeth. 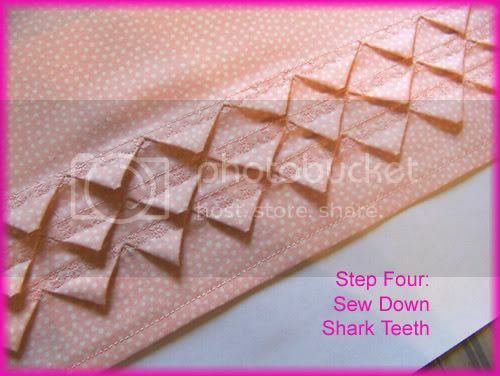 Step 4 - To catch and hold the folds in place, restitch the horizontal tuck seam in a wide zigzag being sure to catch the raw edges underneath the tooth. I used a decorative tulip stitch on this skirt. It is headed to Guatemala as part of The Hundred Skirt Project. I was concerned that the shark teeth be durable to hold up to the more aggressive laundering they will receive at the orphanage (the girls sometimes do their own laundry using concrete washboards!). Step 5 - Press teeth and assemble garment. 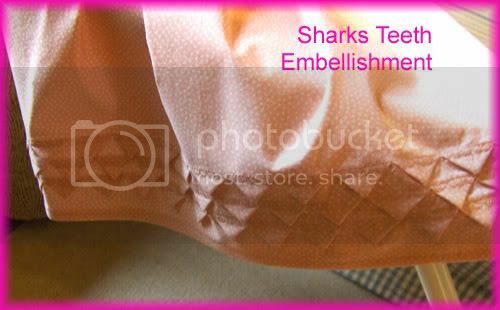 You can see an example of a child's dress with a Sharks Teeth bodice here. Brilliant! I just learned something new thanks to you. Thank you for the fabulous tutorial. This is nice, thanks for the tutorial. Just browsed a magazine I just bought and saw a picture with something from fall 2008 runway with this technique (at least very similar). Immediately thought of this tutorial, as I had seen it yesterday. And now found it on the internet too. Second row, third picture. You know what's fashion soon! Oh, and there's a grey skirt too with this! Welll...how about that! For once I'm abreast with the fashion trends. I'm looking forward to checking that out. Thanks for letting me know, Sigrid. I saw this technique first in the book Manipulating Fabric. I've been wanting to try it for several years and finally got around to it. It's a fabulous book. I'll have to do a review of it soon. thanks ,learnt a new kind of tuck.briliant.thanks again. Vintage Threads is home to The Hundred Skirts Project, a service project to benefit The Shadow Of His Wing Orphanage in Guatemala. 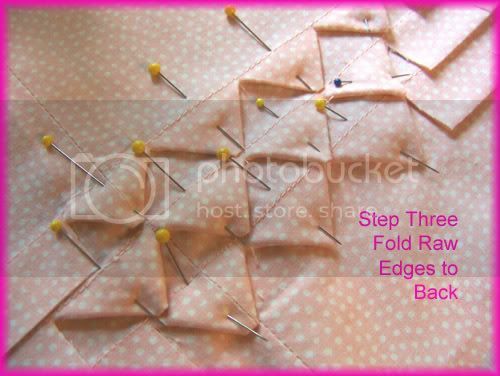 The goal is to sew 100 Skirts, each unique, each with a matching tee and each with a special embellishment of some sort (applique, beading, trim, ruffle, pocket, belt, piping, etc.) As I began to sew skirts and write about my project, interest in the online blogging and sewing community soared. Comments and email poured in asking to be included in the project. Of course I was thrilled and happy to have participation from others. It now appears that, thanks to the generousity of the online sewing community, we will exceed our goal. If you are interested in joining The Hundred Skirts Project, email me at lovelace@mtaonline.net. Below you will find our count. The SKIRTS STILL TO ARRIVE are the skirts that have been promised, but not yet received. The Skirts Received Total are skirts that are now actually in my physical possession and ready for mailing. The list below is a resource that I hope you will find helpful in making beautiful things and learning new skills. I am happy to share these tutorials with you. However, they are my original material and are not to be printed elsewhere, please. Enjoy!